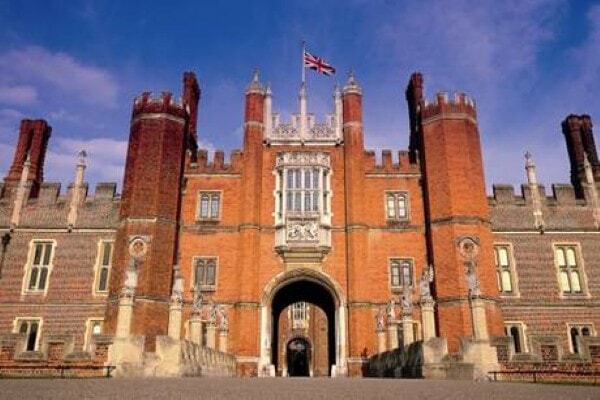 For almost 200 years, Hampton Court Palace was at the centre of English court life, politics and national history. Its most infamous resident was Henry VIII. Hampton Court is a story of two palaces: a Tudor palace, magnificently developed by Cardinal Wolsey and later Henry VIII, alongside a baroque palace built by William III and Mary II. The original palace was built 1515-1521 by Cardinal Wolsey who spent lavishly to build the finest palace in England at Hampton Court. He was later forced to give the palace to Henry VIII as he began to fall from favour. Henry added the Great Hall which was the last medieval Great Hall built for the English monarchy and the Royal Tennis Court, which was built and is still in use for the game of real tennis today. Not the present-day version of the game. This court is now the oldest Real Tennis Court in the world that is still in use. During the reign of William and Mary, parts of Henry's additions were demolished. A new wing was added (partly under the supervision of Sir Christopher Wren), and the state apartments came into regular use. Half the Tudor palace was replaced in a project that lasted from 1689-1694. Hampton Court is one of those places where you can spend a couple of hours or a day. The Palace itself is split into three major sections broadly corresponding to phases in its development. . The most popular is the Tudor section with Tudor kitchens and great Hall. The driest is probably the Georgian section. For each section there is a complimentary audio guide.